Federal Reserve Governor Lael Brainard will be speaking at the Economic Club of New York in New York City. Brainard is a Democrat member of the Fed Board of Governors. She was easily the most dovish FOMC voting member last year, and only reluctantly came to embrace the now orthodox position on monetary policy. In terms of this orthodoxy, the Committee majority subscribe to the view that economic conditions are expected to evolve in a manner that will warrant gradual increases in the federal funds rate. But as the July meeting minutes indicated there is currently something of a divide on the FOMC with some meeting participants increasingly concerned about persistently low inflation as well as an overhasty winding down the Fed’s US$4.464 trillion balance sheet that will result in too much tightening of financial conditions. The minutes do not tell us who these participants are, i.e. if they are FOMC voters, but there are a few candidates one of which is Brainard. Very dovish comments from her do not reflect the views of the Committee majority that still hold to the position that the US labour market will tighten yet further generating some moderate wage inflation down the line. The recent hurricane in Texas will also lift US gasoline prices for the next while, so inflation readings are expected to normalize at least in the near term. A failure to come through with a dovish line, might see Treasury yields decompress a little across the board, and could translate into some limited strength for the US dollar, which in the light of the developments on the Korean peninsula, appears somewhat oversold. It is acknowledged now that the US dollar is increasingly reflecting Trump’s multiple policy and character failings i.e. is associated with a risk-on trade, and has for a while been sold off in favour of the Japanese yen and Swiss franc, and even EM gold, and broader commodity currencies, in circumstances of heightened risk. We have already had a preview of this report via the release of July’s durable good orders’ numbers on August 25. That data set showed good monthly growth ex-transportation, and among orders for non-defense capital goods ex-aircraft. The latter was something of a surprise since orders for machinery overall were somewhat on the weak side. So we see headline factory orders falling by at least 3.0% on the month in July, notwithstanding that excluding orders for transportation items, the underlying numbers will actually look quite good. In June, factory orders rose 3.0%, beating expectations, following a downwardly revised fall of 0.3% in May. June’s strength was not only in transportation equipment, but included increases in orders for machinery (plus 0.4%), furniture and related products (1.9%), primary metals (0.2%) and fabricated metal products (0.1%). Not a market mover. Minneapolis Federal Reserve Bank President Neel Kashkari will be speaking at a moderated Q&A at the “1st Tuesday Speaker Series” at the Carlson School of Management in Minneapolis, with audience Q&A. Kashkari is now a voting member of the FOMC and dissented at the March 14 - 15 meeting when he preferred to maintain the existing target range for the federal funds rate, while the balance of the Committee raised it by 25 basis points. He is now seen as the leading dove on the Committee and is demonstrably not a proponent of the view that inflation is likely to return to the objective of 2% in the medium term. We think the market understands this well, and any references to the need to proceed more slowly and to monitor inflation developments even more carefully, will not impact asset performance at all. Dallas Federal Reserve Bank President Robert Kaplan will be participating in a moderated Q&A session in Dallas, with audience and media Q&A. We do not have details of the subject matter of the debate, but do not expect anything really market moving from Kaplan, who is an orthodox voting member of the FOMC. Some of his comments, however, could be directed at the hurricane-induced impairment of the Texas economy. We will look for any direct referral to local refinery capacity. The Mortgage Bankers' Association compiles various mortgage loan indexes. The purchase applications index measures applications at mortgage lenders. This is a leading indicator for single-family home sales and housing construction. The refinance index tracks refinancing activity, and the composite or market index combines the two. In the week to August 25, the purchase applications index fell 3.0% on the week, with the refinance index dipping 2.0%, leaving the market index lower by 2.3%. We have come to expect volatility in this series, but do note the effect of rising house prices on refinancing activity with 30-year fixed mortgage rates very constrained below 4%. The US dollar index (DXY) has weakened considerably year-to-date (-9.9%), but did rise a little to end-March only to recommence its slide. 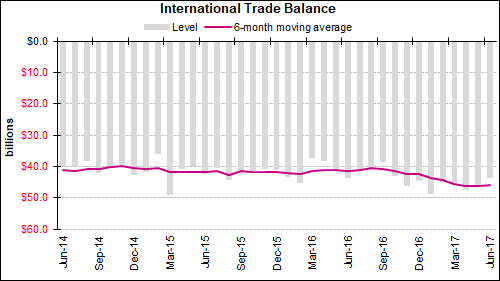 The effect has been noticeable in the recent US trade deficit and GDP readings, where the net trade effect has turned positive for growth. US exports have been rising for most of the year and in May increased to US$192 billion, which was the most in a single month since April 2015, while imports have been falling since March. The deficit has narrowed of late, but is still larger year-on year to end June by 13%, at minus US$277 billion. Last year’s numbers were skewed by a very low August trade shortfall. Nevertheless, the fact that the deficit is growing on his watch has infuriated President Trump, whose agenda includes trade protectionism, and the reduction of immigration in the name of America First (i.e. hiring and buying local). He has accused America’s trading partners of unfair trading practices leading to a loss of US money and jobs. However, in June the deficit did narrow month-on-month from minus US$46.4 billion to minus US$43.3 billion, bettering expectations for minus US$45 billion. And February’s monthly deficit also came in above minus US45 billion. Advance data on the goods’ side of the trade equation should, depending on whether the services surplus grows, lead to a slightly larger deficit, but still short of minus US$45 billion at around minus US$44.6 billion. The ISM July services new export orders sub-index, however, did retreat a couple of points, pointing to slower services export activity down the line. Even in a strong dollar environment the monthly US services surplus remains strong and routinely tops US$25 billion. Amid a weaker dollar, the services surplus really has the propensity to grow. The April new service export orders' measure spiked to over 65 and July could still reflect a follow-through from that reading. The reality is that where US exporters compete on quality, the markets can tolerate higher prices. Where the US seeks to exports goods it more often than not competes on price. If there is to be a surprise, we think it will be on the upside i.e. a deficit which is narrower than expected. Ironically this could feed into some US dollar strength, which in turn could widen the deficit in what is a negative feedback loop. We are not really a follower of this series, which is unofficial and which has been running somewhat below the ISM Manufacturing NMI that is favoured by investors. The benefit in the IHS Markit series is that it provides a preliminary or flash number in the third week of the month. August’s flash estimate rose 2.2 points to 56.9 from 54.7 at the end of July. We regard it as likely that the final August will hold pretty close to the flash estimate, at around 57. We regard some of the earlier monthly readings as a little understated. In July, the services equivalent of the manufacturing PMI, the NMI, fell quite prodigiously to 53.9, from 57.4. This constituted a 3.5 percentage point drop to the lowest level since August 2016. While the outcome represented continued growth in the non-manufacturing sector, the rate of such growth was far slower. The non-manufacturing Business Activity Index decreased 4.9 points to 55.9 percent, while the new orders sub-index at 55.1, was 5.4 percentage points lower than in June. The employment sub-index decreased 2.2 points in July to 53.6, however the prices sub-index increased 3.6 points from the June reading of 52.1 to 55.7, indicating prices increased in July for the second consecutive month. As activity in US manufacturing is intensifying, activity in the tertiary sector is slowing. The two are connected however, such that decelerating services growth will feed back into lower manufacturing activity growth in time. This is due to the linkages manufacturing businesses have with downstream service offerings. 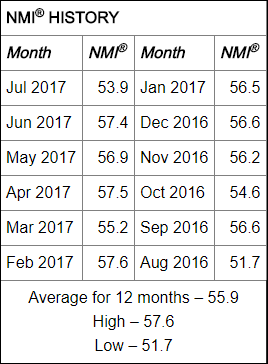 We expect the headline NMI for August to rebound a little to 54.5, a touch lower than the consensus estimate for 55.4. If the expected bounce does not eventuate, we see Treasury yields possibly erasing earlier-in-the-week gains (i.e. underlying Treasuries will strengthen), because the services sector in the US is so integral to growth, comprising over 70% of total GDP by value. The US dollar could in such circumstances come under additional pressure. This report contains anecdotal evidence concerning economic conditions in each of the 12 Federal Reserve Districts forwarded by contacts in these regions. It is utilized as a preparatory document for the next meeting of the FOMC. Where evidence is cited in the FOMC minutes of US economic conditions altering or staying unchanged, such qualitative evidence is drawn from the Beige Book. We will be looking for some indication of the absence of skilled candidates for available positions as well as support for the notion that the US manufacturing sector as well as the export sector are now on a firmer footing and are generating larger payroll numbers. We expect to see confirmation of the recent slowing trend in services. Of greater importance is information of price pressures at the wholesale and retail level, even if regional. The latest Beige Book will probably not reflect too much of post-hurricane Harvey conditions in Texas and Louisiana. In the week ended August 26, initial jobless claims only rose 1,000 to 236,000, which is extremely low by historical standards. We see a rise perhaps of a further 1,000 to 237,000 for the week to September 2. The 4-week moving average that smooths out volatility, remains well below 240,000 at 236,750 for the August 26 week and we still see this figure coming off a little last week. Initial jobless claims are a good leading indicator of payroll creation. The preliminary US Q2 GDP number was upwardly revised to 3.0% quarter-on-quarter annualized from a previous 2.6%. The August Employment Report showed that average hourly earnings rose at a pace of only 2.5% year-over-year, which was lower than the 2.6% expected. So it appears inevitable that the updated report will show productivity revised higher and labour costs taken lower. The two are for the most part inversely related. 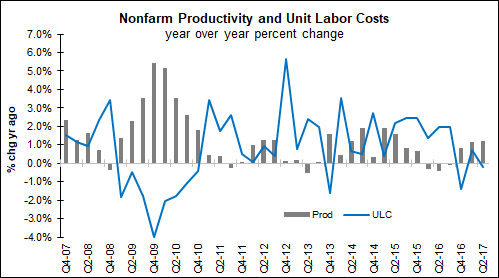 In the advance report, productivity was recorded as rising 0.9% quarter-on-quarter. We expect this to be revised up to at least 1.3% if not more. On the costs side, the initial Q2 report showed a 0.6% gain. We expect this to be revised down to 0.3%. We think these numbers are “baked in the cake” so to speak, meaning that the effect on the anticipated path of the federal funds rate will not be flattened any further. Limited market impact. Cleveland Federal Reserve Bank President Loretta Mester will be speaking about the economic outlook and monetary policy at an event held by the Economic Club of Pittsburgh, the World Affairs Council of Pittsburgh, the CFA Society Pittsburgh, and the Pittsburgh Association for Financial Professionals, with audience and media Q&A. Mester is not now a voting member of the FOMC, but an alternate member. On September 21 last year she famously dissented with two fellow voters (Eric Rosengren and Esther George), preferring a 25bps hike in the target range for the fed funds rate while the majority opted to stay put. She is relatively hawkish as Fed official go, and will likely endorse the view that inflation is on course to reach ‘moderate” levels at or around the 2% inflation objective in the medium term. But she has limited influence these days and her comments will not affect markets. Philadelphia Federal Reserve Bank President Patrick Harker will be speaking on consumer finance issues at the “New Perspectives on Consumer Behavior in Credit and Payments Markets Conference” in Philadelphia. Harker is a voting member of the FOMC, but the subject matter of his address will not generate any market response. The report reflects monthly wholesale trade inventories and sales. The former comprise the more relevant data point. Wholesale trade inventories are seen rising 0.4% on the month in July, equivalent to the July advance estimate. In June, wholesale inventories expanded 0.7%. Wholesalers kept their inventories quite low earlier in the year, because of uncertainty regarding the US consumer. From April, however, significant re-stocking has occurred. This has had a beneficial effect on US GDP growth. This number comes late in the US trading day and well into the weekend for most other markets. The series has produced evidence of increased levels of consumer credit extension, i.e. a measure of consumer re-leveraging. Growth in consumer credit is expected to accelerate further in July with the consensus calling for growth of US$15.7 billion compared to US$12.4 billion in June, which was in itself a big number. Revolving credit (credit card debt), where growth has been limited to date, is rising. This has to raise the question of whether US financial institutions are to a greater degree lending to less qualified borrowers. Growth in non-revolving credit extension has been inclining for some time now. The Standard Bank SA PMI increased to 50.1 in July from 49 in June, signaling expansion. It is worth noting, however, that July’s number was the second lowest reading in 11 months and well below the 6-year long term average of 50.7. Measures of new business, employment and stocks of purchases increased in July, while output fell for a fourth consecutive month. Inflationary pressures remained weak amid a smaller rise in wages. For August, we see the index falling back a little to 50, which is a neutral reading i.e. signifies neither expansion nor contraction. Any surprise is likely to be to the downside. Watch the rand response carefully, in circumstances where the US dollar is likely to remain quite weak amid an elevated gold price. The South African economy contracted an annualized 0.7% on the quarter in the first three months of 2017, following a 0.3% contraction in the previous period and compared to market expectations for expansion of 0.9%. It was only in mid-2016 that quarterly growth of 3.1% was recorded. This marked the first technical recession since 2009 with both the trade and manufacturing sectors recording negative growth rates. On a year-over-year basis, SA GDP growth actually accelerated in the first quarter to 1%, mainly on the back of a rebound in mining and the ongoing recovery in agriculture from the prolonged drought. The comparable rates in both the third and final quarters of last year, were both 0.7%. The annual rate of growth in South Africa since the onset of democracy in 1994 averages 2.84%. It reached an all-time high of 7.60% in the fourth quarter of 1994 and a record low of minus 6.10% in the aftermath of the financial crisis of 2008. We anticipate that South Africa will exit the technical recession, with GDP growth back in expansionary territory quarter-on-quarter, at plus 1.5% due in the main to base effects. Mining will be shown to have at least held steady. Mining production numbers to end-June show that mining output expanded year-over-year every month bar June, when it contracted 0.8% yoy. On a monthly basis it dropped 2.6% in June. The comparable figures for manufacturing show that output rose quite prodigiously in April on the month but was still negative year-on-year, although on an annual basis the situation improved in both May and June. We think the net effect will be positive for the quarter, taking growth back into the green, albeit that the annual growth rate might come down to plus 0.8%. The SARB in July slashed its calendar 2017 GDP growth forecast for South Africa to 0.5%, while the IMF still has it at 1.0%, and Treasury at 1.3%. Any number which accelerates the annual rate of growth above 1% will be good for the rand and for domestically-focused interest rate sensitive stocks like banks and retailers. Gross foreign exchange reserves in South Africa fell to US$46.75 billion in July from US$47.35 billion in June and came in under market expectations for reserves of US$47.1 billion. The decline reflected to a degree foreign exchange swaps conducted for liquidity management purposes as well as foreign exchange payments made on behalf of the government. Partially offsetting the fall was an increase in the US dollar gold price and the weaker dollar against most currencies. We foresee the foreign reserves level holding around US$46.7 billion, which will do little for the rand. 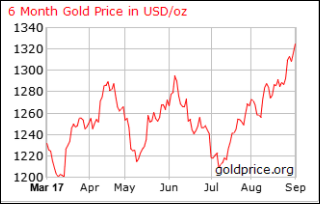 If anything the outcome might beat expectations because the USD gold price rose quite considerably again in August. The measure of foreign reserves has a direct bearing on assessments of South African creditworthiness. A better-than-expected number will see bond yields compress a little. This series is best reviewed on a year-on-year basis so as to assess the contribution sector output has for the overall rate of growth. South Africa's mining production fell by 0.8% year-on-year in June, following an upwardly revised and solid 4.1% gain in May. Output fell for platinum-group metals (minus 13.7% from minus 23% in May), other metallic minerals (minus 11.6% from plus 5.5%), building materials (minus 9.0% from minus 8.2%), iron ore (minus 4.4% from plus 27.9%) and gold (minus 3.6% from minus 3.0%). On a monthly basis, mining output contracted 2.6%, following a 0.1% gain in May. We foresee mining production edging up 0.3% on the month in July, for a 0.8% annual gain. The real benefit of the higher gold price will be seen in mining output numbers for August, but it was already discernible in July. Again, the series is best reviewed on a year-on-year basis so as to assess the contribution that sector output has for the overall rate of domestic growth. SA manufacturing production decreased by 2.3% year-on-year in June, following an upwardly revised 0.9% fall in the previous month and compared with market expectations for a slightly less steep 1.9% drop. This was the third straight month of decline, as output contracted the most for petroleum, chemical products, rubber and plastic products (minus 10.6% versus minus 8.4% in May) and wood and wood products, paper, publishing and printing (minus 4% versus minus 3.6%). On a monthly basis, manufacturing production was unchanged in June after inching lower by 0.3% in May. Since the height of the commodity cycle, which spurred local manufacturing activity, sector output has been in a declining trend as the diagram below indicates. We are looking for monthly contraction of at least 0.2% in July, for an annual decline of 2.8%, which at least will be an improvement on the figures in February and April. Any ZAR strength following the mining production numbers’ release should reverse after this series comes out. Any opinions, news, research, literature, blogs, analysis, prices or other information offered by the Consilium Group services as general market commentary and is provided only for the purpose of independent idea generation. It does not constitute investment or trade advice of any nature. In no event shall Consilium Group be liable for any direct, indirect, special or incidental damage resulting from, arising out of, or in connection with the use of the information. Consilium and the author will not assume any liability in this respect. Stressed further, Consilium Group make no representations or warranties in respect of this website / portal or its content and imbedded reports and will not be liable for any loss or damage of any nature arising from this website / portal, the content thereof, your reliance thereon, its unauthorised use or any electronic viruses associated therewith. Consilium and the author will not assume any liability in this respect. Please note that views shared within commentary or blog publications found within this website / portal belong to that of the author and are not necessarily supported or shared by the Consilium Group. This may equally apply to reports of any other nature found within this website / portal. Should any commentary, blog, report or content found within this website / portal result in you trading, please note that trading any financial product carries a high level of risk to your capital. Past performance of a financial product does not guarantee future results or returns, investors and traders are fully responsible for the market decisions they make. It is essential for investors and traders to further understand that when trading leveraged products it is possible to lose more than your initial investment.